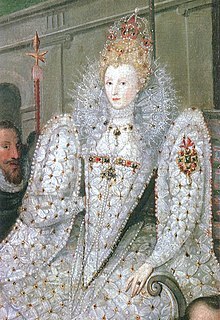 March 24th is the anniversary of the day in 1603 when the greatest queen in England’s history so far (and a contender for most powerful monarch perhaps) died. In 1600 Elizabeth, the last Tudor monarch, had been Queen for 42 years. Many in the kingdom had known no other monarch. At the height of her power during the triumph over the Spanish Armada in 1588, she had created an image of an almost immortal majesty. Yet in the latter years her influence and hold on power were weakening. This was a period of unrest. Wars with Spain and conflict in Ireland rumbled on at great cost. This put a strain on the economy that was not helped by poor harvests. At the same time Elizabeth had become more hard line in her approach to religious non conformists – in particular Catholics. The 1590s had been an era of priest holes and raids in the night. Needing money to pursue her policies and not wanting to take it from a parliament who might impose restrictions on her she instead employed a system of patronage whereby she gained money from supporters in exchange for positions of power and influence and the granting of monopolies which made some men rich at the expense of many others and was a deeply unpopular policy. She maintained an illusion of peace and tranquillity with a combination of propaganda and the suppressing of dissent by the use of a network of informers. Nevertheless support from parliament and the people was waning. In these last years her senior advisor Robert Cecil began making plans for the succession. Elizabeth was not willing to discuss her choice of heir so Cecil had to move carefully. He approached James VI of Scotland who was descended from Elizabeth’s grandfather, Henry VII via Margaret his daughter. He encouraged James to flatter Elizabeth and charm seemed to work because Elizabeth although not as such naming James as heir pretty much implied it. In March 1603 Elizabeth’s health deteriorated probably at least in part due to the death of close friends. She died on 24th and James was named King the same day.